Chief of the Russian General Staff General of the Army Valery Gerasimov had a meeting with his counterpart from Tajikistan Major General Emomali Sobirzoda. The parties discussed issues of raising combat capabilities of the Tajik Armed Forces. General of the Army Valery Gerasimov stressed that all jointly taken measures would allow to neutralize security challenges and threats in the region. General of the Army Valery Gerasimov reminded that the Russian Federation was Tajikistan with weaponry and hardware. Moreover, 607 military servicemen of Tajikistan are studying in educational establishments of the Russian Defence Ministry. The 201st Russian military base holds annual training for up to 1,000 junior specialists. According to Chief of the Russian General Staff, Russia and Tajikistan have common tasks in strengthening security in the Central Asia region. The countries have been building the relations taking into account these tasks. The sides are paying special attention to cooperation in military and technical fields. In his turn, Major General Emomali Sobirzoda expressed his gratitude for the attention paid to development of bilateral cooperation and joint build-up of the army of Tajikistan. YEKATERINBURG, July 27. /TASS/. More than 3,000 anti-aircraft gunners of Russia’s Central Military District are involved in a field exercise of the air defense troops that takes place simultaneously at ranges in the Astrakhan, Orenburg and Chelyabinsk regions of Russia, as well as in Tajikistan, the district’s press service reported on Wednesday. “The drills involve more than 800 units of military and special air defense equipment, as well as more than 3,000 anti-aircraft defense troops. At the final stage of the manoeuvers, tactical exercises with live firing from the S-300, Buk-M2, Tor-M2 anti-aircraft missile systems, as well as from the Tunguska tracked self-propelled anti-aircraft weapon armed with a surface-to-air gun and missile system and Igla surface-to-air missile defense system will be held. It is planned to spend more than 4,000 rounds of ammunition of various types, including more than 120 missiles,” the press service said. The field exercise will last until September 4. “The troops will practice cover of military and civilian facilities from the imaginary enemy’s air attack in unfamiliar terrain in a difficult ground, air and electronic environment”, the press service said. YEKATERINBURG, July 22 /TASS/. The servicemen of the 201st military base deployed in Tajikistan have been woken up on alert, the press service of the central military district said on Friday. Two garrisons located in the cities of Dushanbe and Kurgan-Tyube will hold classes of combat readiness. “The units have been put on high alert. The personnel is drilling maneuvers aimed at fulfilling surprise tasks such as repelling an attack of conditional enemy at vital facilities,” the press service said. The 201st military base is the biggest military facility in Russia located outside its borders. It is located in three cities – Dushanbe, Kulyab and Kurgan-Tyube. Under an agreement signed in October 2012, the unit will stay in Tajikistan until 2042. Today, the delegation of the Russian Airborne troops has arrived on a 3-day visit in Dushanbe, the capital of Tajikistan. According to the agenda, the servicemen of both countries will discuss conditions and prospects of cooperation in the military field, schedule a joint exercise with the use of airmobile units. In the course of these three days, the Russian officers will also visit the Airborne brigade of the Armed Forces of Tajikistan. Russian military delegation is headed by the Chief of the Airborne troops combat training Colonel Sergei Ryazantsev. The visit will last until June 9. March 14 – The main stage of the joint Russian-Tajik exercises will start on Monday, an aid to the commander of Russia’s Central Military District said. “The main phase of the joint command-staff exercises involving the units of the armed forces of the Russian Federation and the Republic of Tajikistan begins today,” Col. Yaroslav Roschupkin said in a statement. The statement added that the command and control units of Taj…ikistan’s Defense Ministry and Russia’s Central Military District as well as the the two countries’ motorized rifle, armored and artillery units, special forces, as well as airborne and air assault groups would participate in the drill. The joint aviation group will reportedly include Russia’s long-range Tupolev Tu-22M3 bombers, the Sukhoi Su-25SM and Su-24M attack aircraft, the Mil Mi-24 attack helicopters and Mi-8 military transport aircraft, as well as the Tajik air assets. The group will provide for the troops deployment and operations in Lyaur, Harb-Maydoni, Momirak and Halkaer firing ranges. 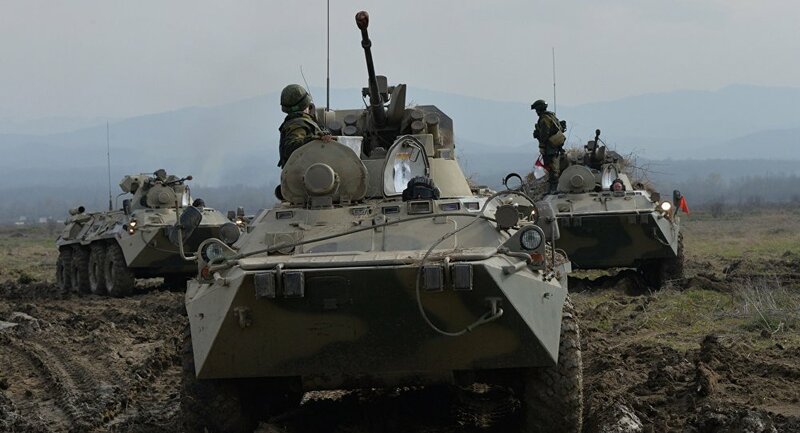 February 29 – Antiterrorist exercises have been conducted at Russia’s Lyaur military range located on the outskirts of the Tajikistani capital Dushanbe, spokesman for the Russian Central Military District Nikolay Berkalov told on Monday. “Reconnaissance teams of the 201st military base were involved in the simulated terrorist headquarters’ seek and destroy mission,” the official said. According to him, “the special o…peration was conducted simultaneously from two sides for the distraction of the terrorists’ attention.” Covered with massed intense fire from heavy-caliber machine guns of the BTR-80 armored personnel carriers, the reconnaissance crews got access to the terrorist facility and opened fire on the gunmen from the first floor. An assault team, using special climbing gear attacked and destroyed the enemy from the building’s roof.